Thanks Richard and Rob for your posts. Last Edit: 6 years 5 months ago by Joerg Yoki. Is that your's Joerg or are you going to bid? Probably going for a tidy sum on Christies! I think it is Gourlay Steell 1819-1894, not Ansdell. florent wrote: I think it is Gourlay Steell 1819-1894, not Ansdell. Rob, I note your comments on the coats of Deerhounds, but the importance of my remarks on mistaking the Aidi or Atlas mountain guardian dogs in the Haagen cast for 19th century Deerhounds, has nothing to do with coat. It has to do with the fact that the sculpted dogs do not have the conformation of Deerhounds - which are by definition a greyhound type of dog. 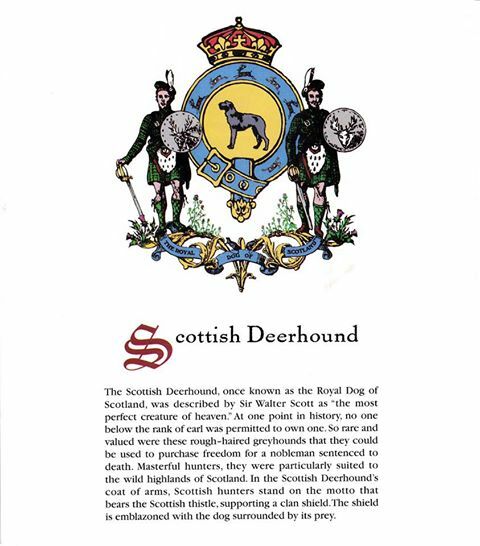 What, by the way, are your historical sources on these supposedly two differently coated types of Deerhounds that you have mentioned before: Scottish Lowland Deerhound and Scottish Highland Deerhound? Richard, my comments were intended to partly address the fact that most of the history prints show Deerhounds to be of shorter coat and more variety of colour. Should you strip the coat from today's dogs then there will still be many, but by no means all, that appear similar in type to many in the prints! At least that is my impression! Not all of today's dogs are disimilar to those of the past and in Scotland there are still many of the old lines continued albeit that they are not coursing Deer or winning shows but I hope that may change! I find it interesting how so many dogs now have the longer coat although of course coat is merely cosmetic! I don't really study Deerhound history in a formal way, I purely like to browse through articles when I have time. I have read several writings of the Lowland and Highland Deerhound. One that I can remember is Captain Graham's writings about the Deerhound on the Irish Wolfhound site. He mentions the Lowland DH with a shorter smoother coat and the Highland dog with a longer and courser coat, he also says that the Highland Hound can have a short temper and be ferocious although not with it's owner. Also if you look back at show champions who have pictures as far back as 1879 then the coats slowly get longer over the decades! A more important issue than merely length of coat may well lay here as if the coat differed as well as the temperament then it may imply that these dogs differed in some way genetically. The history of the Deerhound is shrouded im mystery and it is this that I am interested in. The original Irish Wolfhound which was almost extinct before Captain Graham rescued the breed was rumoured to be more like a Deerhound. I have also seen medieval paintings of what must have been Deerhounds on the lawns of palaces, these dogs were shown with Deer nearby and were very tall and slender looking like the dogs of today that are said to be too tall and not athletic, I would say that they were probably exagerated although other objects in the painting appeared reasonably in proportion. I saw a picture of that painting around 40 years ago and am trying to locate it again but so far without success. Last Edit: 6 years 5 months ago by Robb. Thank you Joerg and Rob. I suspected as much. The following might be a fine distinction, but it is an important one. Before the 1800's it's impossible to find a dog breed or type called a "Scottish Deerhound". 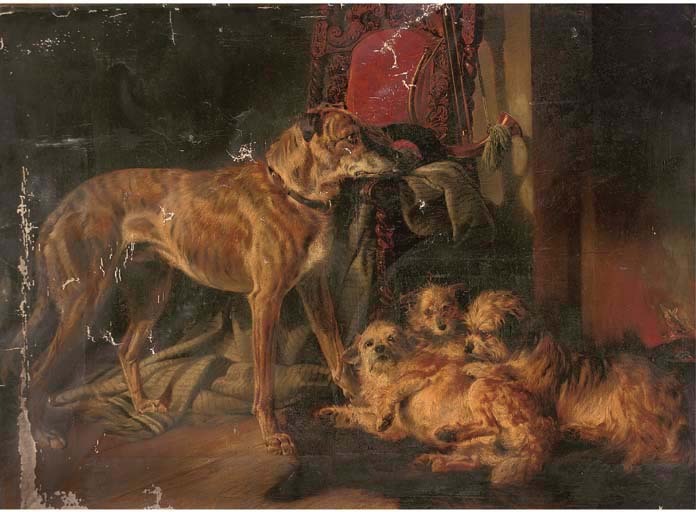 The 18th century references, such as those that Kay Barret makes, come from original sources such as Pennant, and Dr Johnson, and then indirectly from Richardson and Graham, which talk of the different greyhounds and large scent hounds (with pendulous ears) that were used to course or pack-hunt deer. And they were, or could be called "deer-hounds". They may well have contributed to the Deerhound as we know it. But they were not quite the same thing as the modern dog developed as a singular type, with a number of breed lines, called the Scottish Deerhound in the early to late 1800's, which was also known in it's early period as a "deer-hound", and was originally intended to course cold deer. It's why we always make the distinction "deerhound" being any dog type used to hunt deer, and "Deerhound" being a particular breed. Is the "Deerhound" from today a "deerhound"? The Royal Dog of Scotland. (3 ins) to 10 cms (4 ins) long; that on head, breast and belly much softer. A slight hairy fringe on inside of fore- and hind legs. It should be every breeders goal to try achieve this as standard throughout a litter along with the rest of the 'standard requirements'. However I think that there are dogs both in & out of the show ring with longer & softer coats ! With all respect - It's been a while - so, what exactly is the point, or what exactly is the question of the last post? I would also like to add my congratulations to Joerg for taking over a forum which obviously caters to a very real need - and hence to Rob "Teratyke" for intiating it and running it so well for such a long period! Thank you Richard for your good wishes. I have checked again today the e-mail copies of the posts from this day. Thanks Joerg, I guess it must have beeen some sort of 'glitch'. Last Edit: 5 years 2 months ago by Joerg Yoki.